This is a more fitting end for the "Mighty O" than the careless torch of the scrap yard. She now "lies in state" at the municipal pier in Pensacola Florida, a town long associated with the Navy. Pensacola is the site of the first European settlement in the US and the home of Naval Aviation. It is difficult for anyone and impossible for someone who was in the military during WWII, Korea or Viet Nam to walk in the shadow of this magnificent corpse without a lump in his throat! Those who served on her can almost feel the gentle vibration that was always under their feet when she was alive. You can almost hear the whuuump-bam as her hydraulic catapults (later upgraded to steam) flung a Corsair, AD, or a F8 into the air. There is a thin but constant slow procession of people walking slowly around her. Some fascinated, some with a gentle tear, but few who don't stand a little prouder. Most are silent, almost as people walked around Reagan's casket, but there were some old men with blue baseball caps, who point to a specific place: "There was where I stood watch"  or "where my combat station was"  or "where I catted off in my Cougar." USS Oriskany's new "hurricane bow. very costly Cold War. 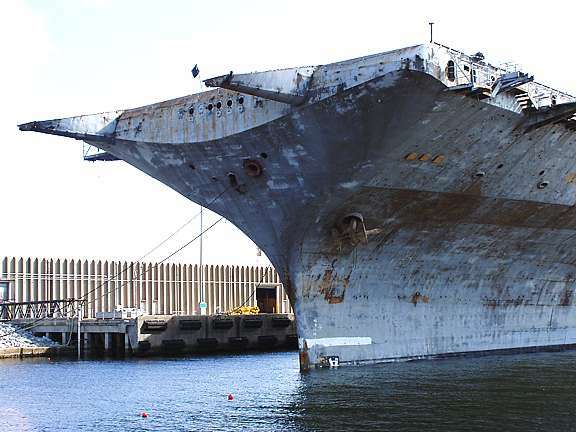 She retired in peace in 1976 but may be buried at sea during a war that she won't participate in. She served her country for 26 years, one of the most heavily used flattops of the Vietnam War. She was truly in a class by herself. She started as an Essex class but with the addition of an angled deck, steam catapults and hurricane bow in 1959, she became the only member of the Oriskany class. Oriskany received two battle stars for Korean Service and five for Vietnamese service. YorkTown, Essex Class Note open bow. 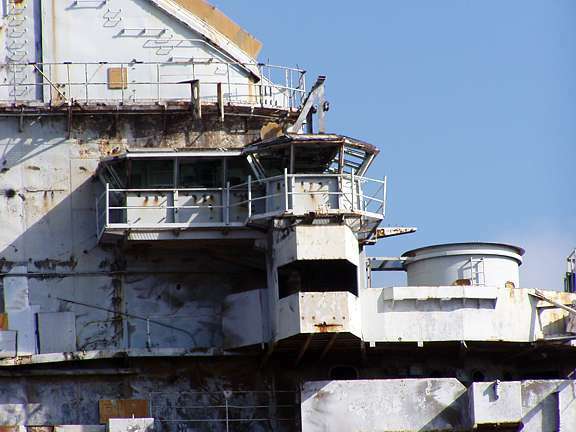 The 888-foot Flattop, if plans work out, will be buried at sea by June 2005 to beat the official start of the hurricane season. She will be the first and largest decommissioned Naval vessel to be sunk for use as an artificial reef. 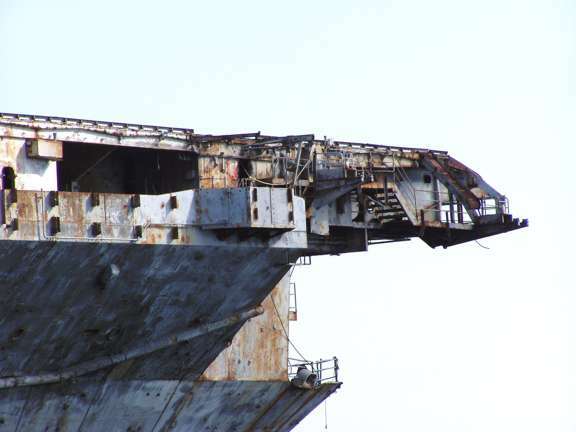 She will rest forever at a site some 22.5 miles SW of Pensacola in 212 feet of water. 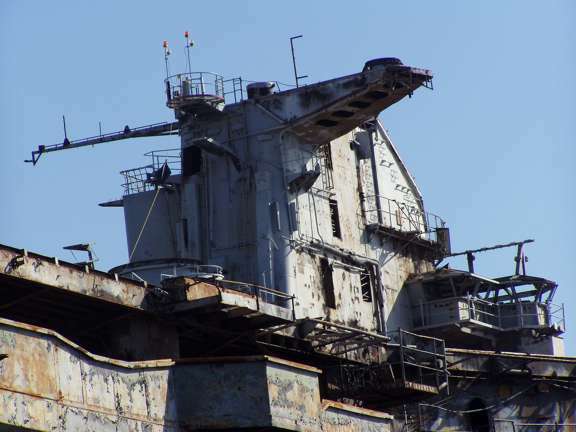 Her massive superstructure will reach to within 60 feet of the surface. The proper burial is no easy task. Remember the 510-foot Spiegel Grove that was set to be sunk six miles off Key Largo in the Florida Keys National Marine Sanctuary? It capsized prematurely, partially floating with its bow out of the water. The rescue required 70 inflatable bags, air injection and two tug boats. They finally got her right-side up on the bottom making her the largest Naval ship sunk to become an artificial reef at the time. They are determined that that won't happen here. The specialized plans include many small C4 explosives along the keel. A radio signal from a boat probably at a distance of at least ½ mile away will set them off. Don't expect fireworks. The explosions probably won't be visible and if everything goes right, she will take about eight hours to slowly with great dignity lower herself right-side up where she will, like the old men in blue caps, continue to serve her country. 05/18/2006 Sitting Pretty! Oriskany now sits as planned facing north on the sandy bottom. First reports show she sunk in the sand slightly deeper than hoped and is 5 to 21 feet deeper than planned. She will be open to divers at noon today. 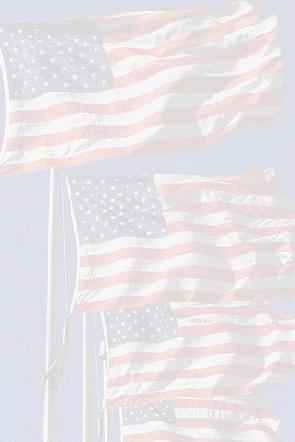 For the whole story, see"
And Kilroy Was There  Isn't he everywhere the military is? minutes. Then, as the water invaded the hanger deck, Oriskany rolled gently to her port and raised her bow high out of the water as if in one last salute to the hundreds of mourners and former crew members there for the service. From that moment it was only about four minutes until she was gone . . . no! Not gone! She will continue to serve her country and her crew as the world's largest man-made reef. People from all over the world came to view this moment. They are expected to come again to scuba-dive on the grave and marvel at her beauty. 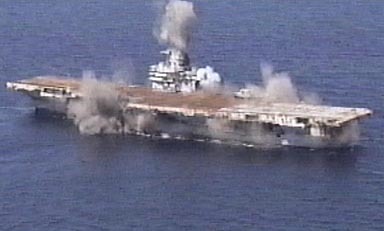 03/01/2006 "The USS Oriskany is headed back to Pensacola in less than a week to become the world's largest artificial reef. 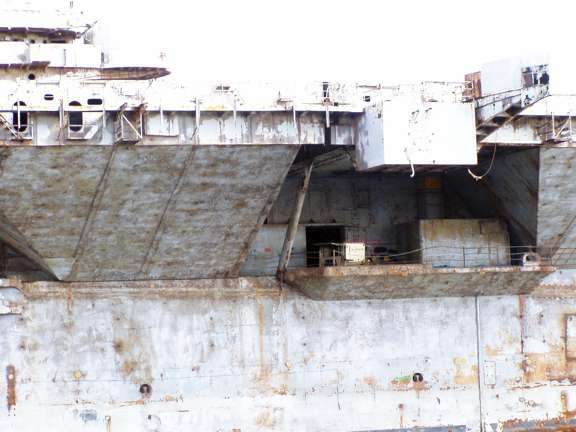 The retired aircraft carrier spent hurricane season in Beamont, Texas. 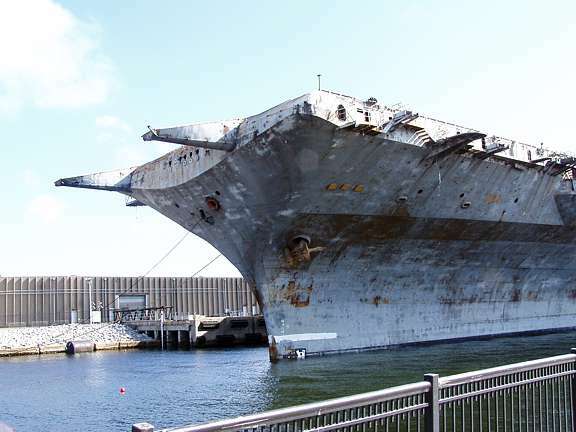 On March 6th it will begin a week long tow toward Allegany Pier, NAS Pensacola for two months of prep work before it is sunk on May 17th. Divers and fisherman are expected from all over the world for the sinking...a 2004 Florida State University study estimated that 92 million dollars a year will be pumped into the local economy. VADM Jack Fetterman/United States Navy (Ret. ); "It's gonna be a tremendous amount of impact on especially for hotels coming out and I think it really ties in with this waterfront project we're trying to put together." 01/11/2006 With luck, the Oriskany will become a fishing reef by June 1, beating the next hurricane season. $2.8 million project now $12.73 million and counting. "With all the money we've sunk into this thing, we probably could have built three replicas out of clean steel. It might be funny if there weren't so much money involved." Retired Vice Adm. Jack Fetterman, who was instrumental in luring the Oriskany to Pensacola, said he has pleaded with officials for months to "just sink the thing and be done with it." "I don't think the Navy expected in their wildest dreams it would be this difficult," he said. "I would not like to be the program manager trying to explain to my boss how the price has become this astronomical. But I've got a certain comfort level that it will be back. They've got too much invested in it." 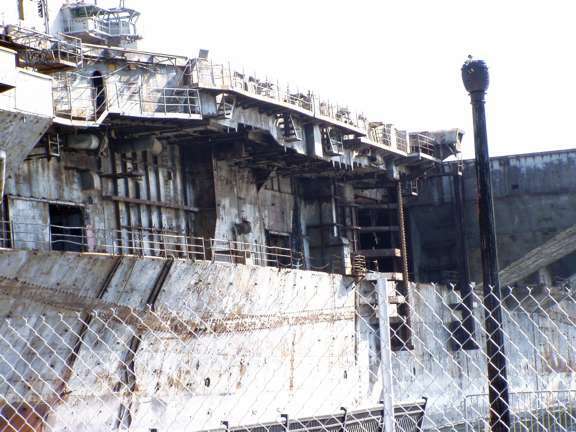 09/26/2005 I just received word that USS Oriskany survived and is in good shape! However, she may not be returned to Pensacola for internment if preparation not completed by January - another hurricane season delay. Watch here for details coming soon. 09/23/2005 USS Oriskany, moved to Texas to avoid hurricanes, now faces Rita The ship is currently moored about 75 miles east of Houston, facing a dangerous hurricane of at least Category 3. The Navy has no plans to move the Oriskany out of Rita's projected path!.See the Beaumont Enterprize story for details. 2/13/05 Burial Date Delayed! The burial is delayed until after the next hurricane season. They planned on a burial in June but the death of the scientist responsible for environmental assessment forced a postponement. She will be prepared in a "hurricane mooring arrangement" until after the next hurricane season. The Pensacola Historical Society is offering the "Oriskany Parking Lot Program." At noon every Saturday a former USS Oriskany crewman, Robert Price, will give a 25 minute lecture about the historic ship. The tour is free and will continue until the ship's burial. Tours are conducted in the parking lot behind Oriskany at the Port of Pensacola. 2004: Towed by ocean going tugs, she left Corpus Christi, Texas for Pensacola, where she will undergo final preparations to be buried. 2004: Escambia County, after exhaustive selection process, was selected as site for burial. 2004: Towed to Corpus Christi, Texas, for cleaning and preparation as an artificial reef. 1999: Towed around the horn to Beaumont, Texas. 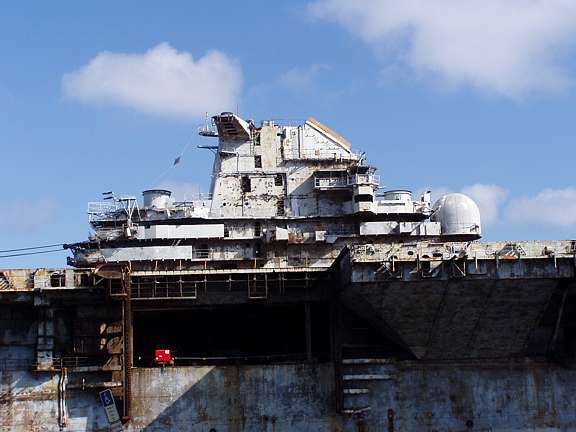 1995: Sold for scrap, Vallejo, Calif.
1989: Stricken from the Naval Vessel Registrar. 1972: 150 nautical miles east of Da Nang, South Vietnam USS ORISKANY and the USS NITRO (AE 23) are in a minor collision during an underway replenishment. 1969-1973: Oriskany conducted combat operations off Vietnam. 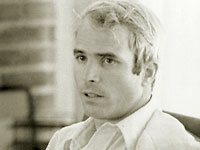 1967: Senator John McCain, R-Ariz (then Lt. Commander) was shot down and taken prisoner after taking off. 1966: Oriskany Suffers a major fire while operating off Vietnam. 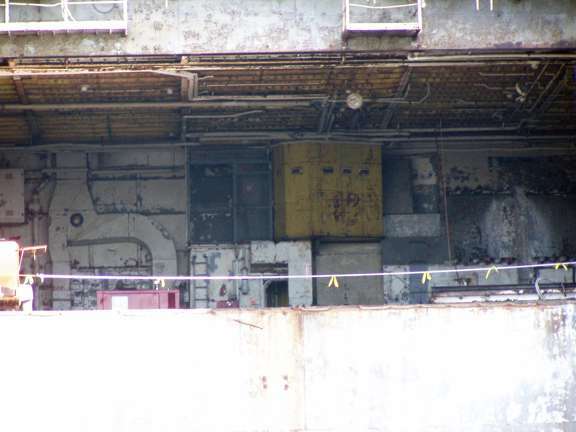 The fire starts when a crewman panics and throws a flare, which had accidentally ignited while being moved, into a storage locker located at the forward starboard corner of hangar bay one. The locker contains some 650 other flares which ignite in turn. The resulting fire takes three hours to control, kills 44, destroys or damages six aircraft, and puts the ORISKANY out of action for several months. 1965: Oriskany's pilots of Carrier Air Wing 16 flew their first combat sorties of the Vietnam conflict on May 8, 1965. 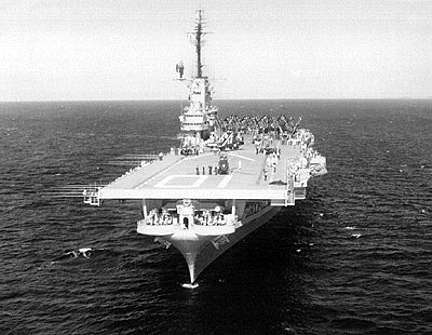 1958-59: Angled flight deck and hurricane bow added during major renovation. 1952-53: Combat operations off Korea. 1952: Arrives at home port, San Diego. 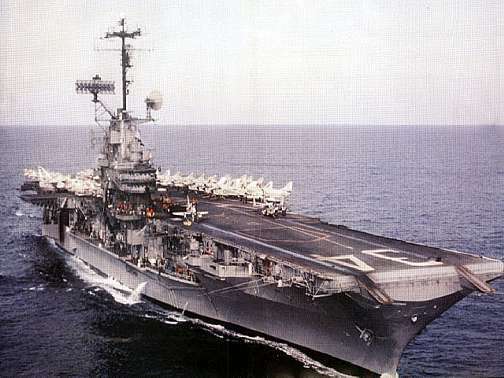 1952: Becomes first aircraft carrier to round Cape Horn. 1950: Commissioned, New York Naval Shipyard. 1943: Congress authorizes construction of attack aircraft carrier USS Oriskany, CV-34. Oriskany, NY, a village in between Rome and Utica, NY is a small town that holds a lot of history. The name itself is derived from "Oriska," for "River of Nettles." It was named by the Oneida Indian Tribe. The Battle of Oriskany is considered the turning point of the war and the Bloodiest Battle of the Revolutionary War. Official homepage of the USS Oriskany, CV/CVA-34.